DCI, as envisioned by its creators, is something distinct from mix-ins or delegation, however it seems in Ruby these are the two ways that people have chosen to implement it. This makes me believe that the way Rubyists are attempting to implement DCI does not live up to the original idea, but that’s a subject for a different blog post. Let’s look at what’s happening here. First, we’re mixing the “Fool” module into the metaclass of the “rubyist” object. Since this is an instance-specific modification, unless “rubyist” already has an instance-specific metaclass, the Ruby VM needs to allocate a new one which will exist for the lifecycle of this object. Okay, so we’re allocating more memory than we otherwise would. That doesn’t seem too bad, does it? What if I were to tell you that the performance impact you’re seeing here wasn’t just localized to the little snippet we’re microbenchmarking, but is in fact having non-local effects that are causing similar performance degradations throughout your Ruby application? Scared now? This is exactly what’s happening. All Ruby VMs use method caches to improve dispatch speed. They can, for example, cache which method to use based on the types flowing through a particular call site. These caches remain valid so long as we don’t see new types and the class hierarchy doesn’t change. Unfortunately, what this approach to DCI is doing by using an instance-specific mixin is making modifications to the class hierarchy at runtime, and by doing so, it’s busting method caches throughout your application. By busting these caches everywhere, the performance effects you see aren’t localized just to where you’re using DCI. 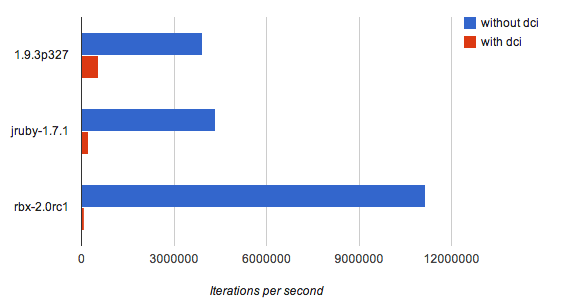 You’re taking a pathological performance hit every time you use obj.extend(Mixin). This becomes especially problematic if you’re performing these sorts of runtime mixins every time you handle a request (or worse, multiple times per request). By doing so, you are preventing these caches from ever filling, and forcing the VM to dispatch methods in the most pathological way possible every time you use this feature. Ruby gives you a lot of expressive power, but with great power comes great responsibility. My advice to you is to completely avoid using any of Ruby’s dynamic features which alter the class hierarchy after your application has loaded. They’re great to use when loading your application, but once your app has been loaded, you should really avoid doing anything that creates instance-specific metaclasses. This isn’t just limited to extend on objects but also includes things like doing def within a def, def obj.method, class << obj then making modifications, or define_method. What’s a better approach to doing something like DCI that doesn’t blow your method cache? Delegation. Evan Light blogged over a year ago about DCI that respects the method cache using SimpleDelegator. In addition to respecting your method cache, I personally also find this approach a lot cleaner.